Johnston County was formed in 1746 from Craven County. It is named for Gabriel Johnston, royal governor of North Carolina from 1734 to 1752. Johnston County, North Carolina offers great connections to history, entertainment, dining, lodging, and outlet shopping, along with a generous helping of true southern hospitality. Located midway between New York and Florida on I-95 and at the cross-roads of I-95 and I-40, Johnston County connects the nation&apos;s North and South with East and West. Its location places it only a two-hour drive from Atlantic Coast Beaches and a four-hour drive from the Blue Ridge Mountains. Statistics, Population, and other useful information. Johnston County is home to eleven towns, listed alphabetically: Archer Lodge, Benson, Clayton, Four Oaks, Kenly, Micro, Pine Level, Princeton, Selma, Smithfield (county seat ca. 1771), and Wilson&apos;s Mills. The Bentonville Battlefield State Historic Site is the location of the last major battle of the Civil War and the largest military engagement ever fought on North Carolina soil. Atkinson&apos;s Mill is a working gristmill dating back 240 years. The Tobacco Farm Life Museum preserves an authentic slice of eastern North Carolina&apos;s rural heritage. The Ava Gardner Museum celebrates the career of the film legend who was born and raised near Smithfield. The Johnston County Heritage Center preserves the history and material culture of Johnston County with an exceptional collection of materials that includes 2,000 books, 800 reels of microfilm, 300 maps and atlases, 50,000 photographic images, 400 private collections of books and papers, and vertical files on genealogy, biography, and local history. Shoppers far and wide visit the 80 discount outlets and shops at Carolina Premium Outlets in Smithfield. Operating under the philosophy that every child can learn when a school system respects the individuality of each learner, Johnston County Schools structures their curriculum, programs, and staff to foster a flame for learning within every child that will last a lifetime. In the elementary schools, children learn by hands-on observation, a literature-based reading program, and a process-oriented writing program. In the middles, core academic teacher teams, teacher-based guidance programs, and exploratory curriculum courses strive to make use of the best features of both elementary and high school programs to serve this unique age group. Since 1969 Johnston Community College has been providing an affordable higher education alternative that has helped thousands of the region&apos;s adult population become better equipped for the job market, while also providing a means for local citizens to earn high school diplomas and learn special skills to improve their quality of life. The college transfer program helps many young people cut the often insurmountable costs of a college education and at the same time ease the transition from high school to a four-year college. The communities of Johnston County have many things in common--a relaxed atmosphere and friendly people. From community festivals to sporting events, Johnston County is a kaleidoscope of unique sights, sounds, ideas and experiences complemented by a colorful array of rural and small-town history and culture. In the antebellum times of the 1840&apos;s, the most vociferous advocates of inland waterway transportation were reluctant to yield their enthusiasm to the burgeoning railroad industry, but popular interest in rails overshadowed interest in river transportation during the two decades immediately preceding the Civil War. The first railroad built across Johnston County - the 223-mile state-controlled North Carolina Railroad from Goldsboro to Charlotte (via Raleigh and Greensboro) was completed in 1856. It bypassed Smithfield some four miles to the north, following a beeline between Goldsboro and Raleigh. Smithfield passengers boarded the train at a station originally called "Smithfield Depot," located just west of what is now Selma, where Buffalo Road crosses the present-day Southern Railway. The depot later became known as "Mitchener&apos;s Station." Smithfield travelers and merchants were hardly pleased by the location of the North Carolina Railroad, since Smithfield Depot was almost an hour&apos;s drive from the heart of Smithfield by wagon or hack. Tradition, still persistent in the latter half of the twentieth century, has asserted that Smithfield residents opposed locating the railroad through the town, that they did not want noisy trains disturbing their peace nor steam engines polluting their clean air with smoke. Succeeding generations have been told that a "Smithfield man" voted against locating the railroad through Smithfield, and that the town lost the railroad "by one vote." Two Johnston County members of the Legislature did vote against the legislation that incorporated the North Carolina Railroad in 1849, and a single vote ultimately decided whether the railroad was to be approved. But legislative records do not support the legend preserved by spoken words. Representative Andrew J. Leach of Johnston voted against the railroad bill on all readings, and Johnston&apos;s Senator William H. Watson voted against it on the final reading. Apparently both legislators voted as they did because they lacked assurance that the surveyors would lay out the railroad&apos;s route through or at the edge of Smithfield&apos;s corporate limits. Senator Watson, who supported the bill on first and second reading, offered an amendment requiring the railroad to serve Smithfield directly and not bypass it some miles away. When the amendment was rejected, he withdrew his support of the railroad charter. His shift to the opposition deadlocked the Senate, and the presiding officer was compelled to break the tie. He voted "aye." The coming of the North Carolina Railroad to Johnston County was the impetus that (after 1860) gave rise to the towns of Princeton (originally chartered as Boon Hill), Pine Level, Selma, Wilson&apos;s Mills and Clayton (earlier Stallings Station), just as a north-south railroad, the Wilmington and Weldon Railroad forerunner of the Atlantic Coast Line in the late 1880&apos;s would bring into being the towns of Kenly, Micro, Four Oaks and Benson. Although the North Carolina Railroad was not completed all the way between Goldsboro and Charlotte until 1856 when opposite ends of the line were joined near Greensboro, service began shortly after rails were laid across the county in 1854. The coming of railroads would make a difference in the economic and geographical complexion of the county. They also would open the outside world to residents of Smithfield and the rest of the county who had not been able to afford travel by stagecoach. Before railroad service came to Johnston, one-way travel by stage from Goldsboro to Charlotte cost $23 (more than the monthly income of a school teacher in the 1850&apos;s). The original train fare from Goldsboro to Charlotte, one way, was only $5. From time immemorial to the eighteenth century, there were Indian villages and Indian trails in the upper Neuse River region of North Carolina that became the land of Johnston County. Early English explorers and settlers who penetrated this region in the middle 1700’s or earlier moved along Indian trails even as they were guided by the course of the Neuse River in traveling west from New Bern. Wake County was formed from western Johnston County in 1771. Other portions later were taken to form Dobbs, Wilson and Harnett counties. Today, Johnston County covers 795 square miles, the state’s eleventh largest. The county was named for Gabriel Johnston, Royal Governor of North Carolina from 1734 to 1752. Johnston County was originally inhabited by Tuscarora Indians, a tribe of great size and strength. Early settlers were Scotch with the English coming in later. In the early days of colonization of North Carolina, Johnston County played an important part. Many of the county citizens of that time were leaders of the colony. 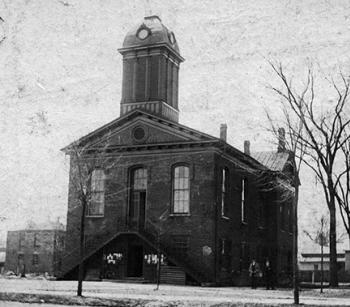 A riverside courthouse was built in Smithfield in 1771 and served as the seat of county government until 1786 when the court ordered a new one built at Second and Market Streets. The North Carolina legislature met in the new courthouse on May 3-5, 1779. Here in the 21st Century, Smithfield and Selma are towns looking much younger than their actual ages. Smithfield was founded in 1777 - more than two centuries ago. Selma was established in 1867, officially chartered in 1873. Yet neither town has buildings and houses showing its vintage. Both are really towns of the 20th Century - products of the Victorian Era of the 1890s and early 1900s. That&apos;s when emerging railroads created corridors of trade for all sorts of mercantile enterprises and cotton mills introduced our region to industrialization. 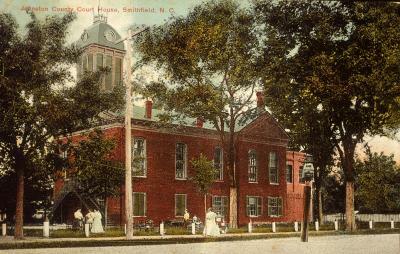 Smithfield - the county seat since its establishment - was naturally Johnston County&apos;s largest town in 1890, but had just 550 residents. 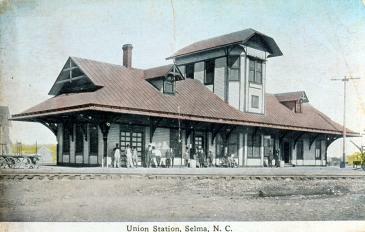 By 1900, Selma - at the junction of two railroads - had grown to become Johnston&apos;s largest town, with 816 residents. What a change the next couple of decades produced. By 1920, Smithfield had 1,895 residents; Selma had 1,601. And both towns had seen their business districts flourish with construction of numerous multi-story brick buildings fronting newly-paved streets. Both towns got electric lights and water systems around 1913 that accompanied a building boom for many handsome houses that still line residential streets almost a hundred years later. Many of the towns&apos; enduring church houses were also built between 1910 and 1920. And while agriculture has been the region&apos;s economic backbone for more than two centuries, commercialization of farming didn&apos;t arrive until the dawn of the 20th Century - another reason for the slow development of our towns. The Smithfield Tobacco Market wasn&apos;t established until 1898. Actually, Johnston County&apos;s No. 1 cash crop a hundred years ago wasn&apos;t even tobacco. Instead, it was "King Cotton." No surprise, then, that Selma saw establishment of three cotton mills, and Smithfield two, during the first decade of the 20th Century. By 1924, Johnston County had more than 85,000 acres planted in cotton, and just 10,012 in tobacco. The Great Depression of the 1930s brought cotton&apos;s demise here, as elsewhere. And today, not a single cotton or textile plant remains in operation in either Selma or Smithfield. What filled the economic void left by cotton&apos;s collapse was a second, more dramatic wave of local industrial development in the decades of national prosperity that followed World War II. Frank Holding - a Smithfield business and political leader whose family developed and still controls Raleigh-based First Citizens Bank - recalls the campaign that brought the first modern-age industry to Smithfield. "It was a community effort," he said. "Thirty-five people put up $5,000 apiece to build that plant." Its occupant was an apparel enterprise that began operating in 1954. A similar community effort in 1958 landed Selma&apos;s first modern-age industry: an electronics plant that continued as a property of the worldwide Eaton Corporation. Several additional industries arrived on the scene during the 1960s - all recruited by community leaders willing to assemble land and provide financing for buildings. "It took a lot of effort in those days to get things done," Mr. Holding recalled. Meanwhile, agriculture was undergoing a transformation of its own in the post-war era. M.W. (Mokie) Stancil - whose family has operated Selma-based Stancil Oil Company for half a century - remembers when Smithfield and Selma had numerous livery stables in their central business districts. In the early 1940s, he recalled, "you could count the tractors in field - there were so few of them." Farmers were still relying on mules to nurture their crops and move their goods to market. Mechanization of agriculture in the years that followed dramatically reduced the region&apos;s number of farm laborers. And that sent many Johnstonians off to big cities to the north and west in search of gainful employment. As a result, the county&apos;s population actually declined for the first and only time in the 20th Century: from 65,906 in 1950 to 62,936 in 1960. It was no coincidence that the push by community leaders to recruit new industries gathered momentum as the farming exodus accelerated. Tobacco was another story. Even as the number of farm laborers declined, Johnston County&apos;s tobacco farmers prospered as never before in the post-war era. Just as livery stables had been prevalent in earlier days of the 20th Century, tobacco-auction warehouses dominated the streetscape of Downtown Smithfield by mid-century. Naturally, the proximity of those warehouses to the shops of local merchants made the summertime tobacco-selling season the most important economic event of the year around here. During the last decades of the 20th Century, Downtown Smithfield&apos;s warehouses vanished along with the livery stables, replaced by new tobacco-auction houses concentrated along U.S. Highway 301 South - appropriately renamed by the Town of Smithfield a few years ago as "Bright Leaf Boulevard." The Smithfield Tobacco Market flourished during this time, becoming one of the largest in the world. In 1999 market sales topped $78 million. However, tobacco&apos;s demise nationally, eventually took its toll of the Smithfield Market. Today all tobacco companies are contracting directly with farmers. Still urbanization remains our region&apos;s predominant economic trend since the 1960s, and the physical characteristics of our communities reflect that fact. Just as the railroads brought boom times to Selma and Smithfield a hundred years ago, superhighways - coupled with our proximity to fast-growing Raleigh and the Research Triangle - have brought unprecedented commercial growth to our towns in recent decades. First it was Interstate 95, opened to traffic in 1960, followed by upgrades to U.S. 70 from the west that spurred a boom in retailing as well as motels and restaurants serving tourists. Finally, the opening of Interstate 40 in 1989 has seen Johnston County flooded with new residents. Mokie Stancil remembers when U.S. 301 between Selma and Smithfield was a two-lane country road lined by farms and woods. "There was only one gas station there," he recalled - about midway between the towns, which were then four miles apart. Today, that stretch of roadway is a five-lane boulevard lined by an unbroken string of retail establishments. What&apos;s more, the two towns have grown together - their borders now contiguous. Foreseeing what was taking place 30 years ago, leaders of the once-separate Selma and Smithfield chambers of commerce agreed to a merger, and the Greater Smithfield-Selma Area Chamber of Commerce was born in 1970. The transformation of the landscape alongside Interstate 95 just east of the two towns is equally striking. Today, more than a dozen motels with a total 1,800+ rooms stand near I-95&apos;s Smithfield-Selma interchanges, and the ever-expanding Carolina Premium Outlets and neighboring retailers have become a shopping mecca for both Interstate travelers and residents from 50 miles around. Predictably, the business boom along I-95 and U.S. 301 has decimated the traditional merchant base of Selma and Smithfield&apos;s downtowns. But out of those economic ashes are rising rejuvenated town centers as we move into the new century. Downtown Selma&apos;s transformation has been an overnight success story. From a starting point in the spring of 1997, Selma&apos;s leaders have mounted a successful campaign to lure shops specializing in antiques and collectibles to refill many of the town&apos;s early 20th Century storefronts. The district even has a new label emphasizing its rebirth. Today it&apos;s known as "Uptown Selma." Downtown Smithfield is undergoing a metamorphosis of its own. Hoping to capitalize on a relatively new national trend known as Heritage (or Cultural) Tourism, the Downtown Smithfield Development Corporation is promoting several historical attractions, including the Ava Gardner Museum, the Johnston County Heritage Center and Smithfield&apos;s colonial-era riverfront. It will be fascinating to see what the next decades bring to Selma and Smithfield. Wonder what historians looking back upon the 21st Century will lift up as highlights of our two towns&apos; development?